The Pleasant Poppy: Mexican Stuffed Shells...Who Needs Tacos? 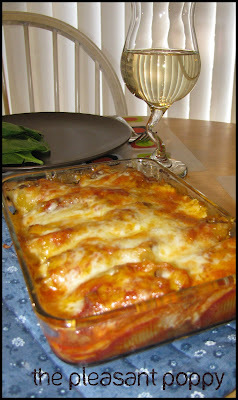 Tonight we tried Mexican Stuffed Shells. Again a recipe that I found on Pinterest turned out to be a winner. My kids devoured the serving I gave them and asked for more. We will be making these again for sure. In a frying pan cook ground beef; add taco seasoning and prepare according to package directions. Add cream cheese, cover and simmer until cheese is melted. Blend well. Set aside and cool completely. While ground beef is cooking, cook the pasta shells according to directions; drain. Set shells out individually on cutting board/baking sheet so that they don’t stick together. After 30 minutes, add shredded cheese, bake for 10-15 more minutes, foil removed. Serve with sour cream. It is Sara. It is.